As the days to Christmas dwindle, I find myself behind on my Christmas cards. Yes I played along with tons of challenges over the year but still, still I am behind. So today I just wanted to do something relaxing and on the simpler side. What I came up with is the card you see above. 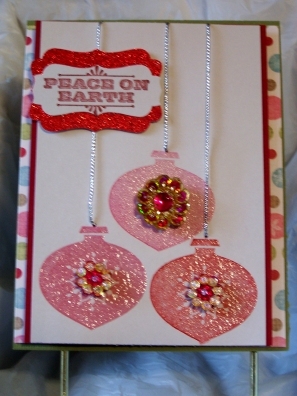 Although the Delightful Decorations stamp is beautiful in and of itself, I had to add some BLING. The dsp and silver twine are both scraps from my stash. The sentiment is from Stampin' Up! Merry & Type stamp set. The glitter paper is also Stampin' Up!